Heat oil in large skillet on medium-high. Add pepper and zucchini; sauté until crisp-tender. Remove from heat and toss with pesto. Warm tortillas. Spread each tortilla with 2 tablespoons hummus. Divide pepper, zucchini, spinach and feta among tortillas. Fold or wrap to serve. Tip: Any flavor of Archer Farms Hummus works well, such as Sun-dried Tomato or Spinach Artichoke. This sound great and simple to make. Thanks for sharing on Real Food Fridays. Pinned & twitted. 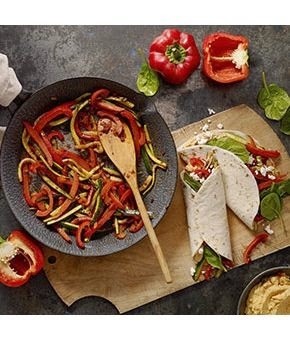 Your spicy Veggie Wrap looks mouthwatering, just might be made today. Thank you for sharing with the Clever Chicks Blog Hop! I hope you’ll join us again next week! I love any mexican dish so you got my vote with this one! It looks delicious! Found you via the Healthy, Happy, Green & Natural Party Hop. Yum! The ingredients in this wrap look so good! I am a big fan of 'wrap and go" meals like this--especially for lunch! Thank you so much for sharing the your healthy and delectable Spicy Veggie Wrap recipe with us at the Healthy, Happy, Green and Natural Party Blog Hop. I'm pinning and sharing!